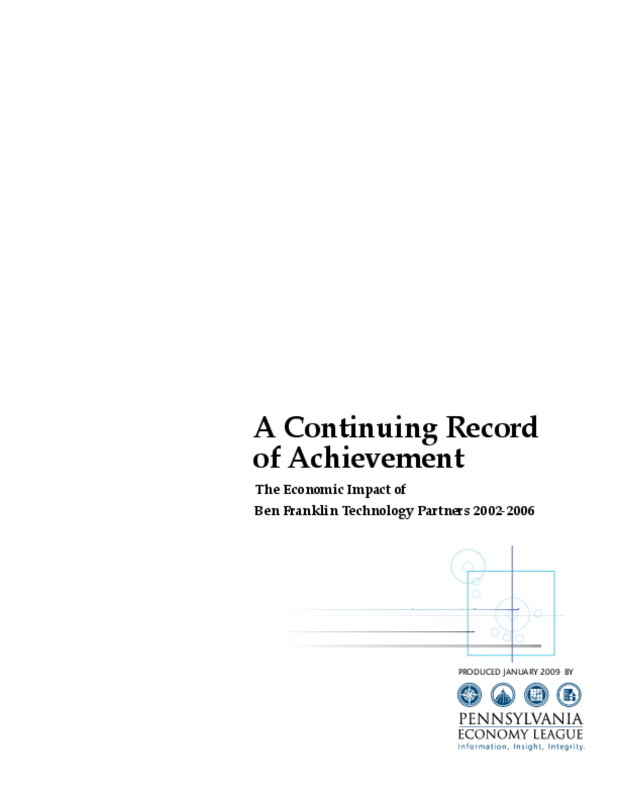 The Economy League of Greater Philadelphia was commissioned by Ben Franklin Technology Partners to conduct an independent, objective evaluation of the economic impact of the program from 2002 to 2006, focusing on its role in providing financing and related services to early-stage and established technology-based firms in Pennsylvania. In 1982, the Pennsylvania General Assembly established the Advanced Technology Centers of the Ben Franklin Partnership to promote technological innovation and spur conomic growth in the Commonwealth. Since then, in a series of subsequent legislative acts, the organization took its present-day shape as the Ben Franklin Technology Partners (BFTP). Over the years, BFTP has periodically supplemented its annual performance assessment with in-depth analyses of the impact of the program. With the arrival of its 25th anniversary since beginning operations, BFTP decided to undertake another in-depth evaluation of the impact of its funding and services on individual companies and the overall economy of Pennsylvania. This study continues BFTP's efforts to objectively measure the impact of the program and gather information that is useful for future strategy and program enhancement. BFTP boosted the Pennsylvania economy (Gross State Product) by $9.3 billion from 2002 through 2006, or $8.7 billion after adjusting for inflation. Since 1989, BFTP has boosted the state's economy by more than $17 billion. From 2002 though 2006, the Commonwealth received more than $517 million in additional state tax revenues as a direct result of BFTP. That represents a 3.5-to-1 payback to the state on its $140 million investment during the same period. From 2002 through 2006, BFTP generated 10,165 additional job-years* in client firms. Client impacts ripple throughout the Pennsylvania economy, contributing to higher Gross State Product and additional employment across the state. From 2002 through 2006, BFTP generated an additional 22,667 job-years in the state beyond those in client firms. BFTP produced a total of 32,832 job-years in the Commonwealth between 2002 and 2006 that otherwise would not have existed. Since 1989, BFTP has generated 45,667 additional job-years in client firms. Since 1989, BFTP generated 80,160 additional job-years beyond those in client firms, for a total of 125,827 additional job-years. Copyright 2009 Economy League. All rights reserved.